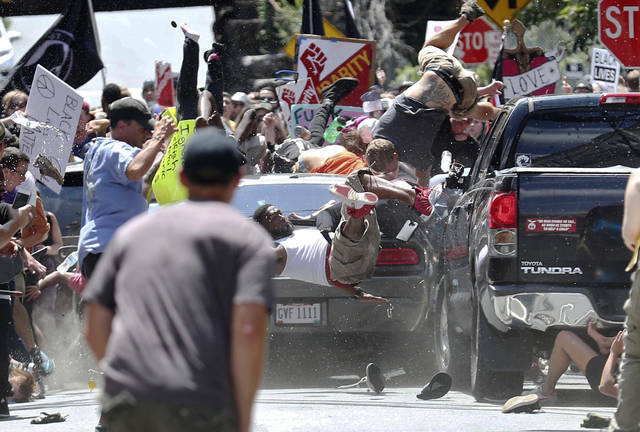 People fly into the air as a vehicle drives into a group of protesters demonstrating against a white nationalist rally Saturday in Charlottesville, Va. The nationalists were holding the rally to protest plans by the city of Charlottesville to remove a statue of Confederate Gen. Robert E. Lee. There were several hundred protesters marching in a long line when the car drove into a group of them. CHARLOTTESVILLE, Va. — A car plowed into a crowd of people peacefully protesting a white nationalist rally Saturday in a Virginia college town, killing one person, hurting at least two dozen more and ratcheting up tension in an increasingly violent confrontation. https://www.delgazette.com/wp-content/uploads/sites/40/2017/08/web1_117984718-34e0a90e96394a68a7f3dc1e7f268e6c.jpgPeople fly into the air as a vehicle drives into a group of protesters demonstrating against a white nationalist rally Saturday in Charlottesville, Va. The nationalists were holding the rally to protest plans by the city of Charlottesville to remove a statue of Confederate Gen. Robert E. Lee. There were several hundred protesters marching in a long line when the car drove into a group of them.